Nation security was enhanced by cutting edge surveillance drones, 50 US military bomb-disposal robots operating in Afghanistan and digital command centers representing just a few of governments technological expenditures, that also include stadiums, high-tech surveillance helicopters and Chinese X-Ray Inspection machines. Add in facial recognition glasses, connectivity and 4K UHD for the first time, and you start to understand why this was truly the most secure, sports tech-centric event ever, at the world’s biggest sporting event, all backed by Intel. Drones were first used during the Sochi Winter Olympics and have since been used for a competitive edge by sports organizations. 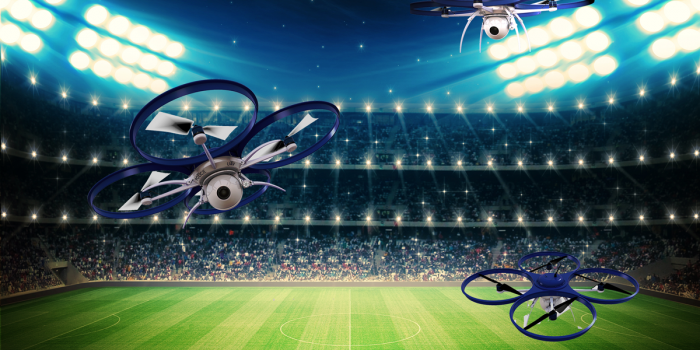 The Israeli company Elbit Systems, sold Hermes 900 unmanned ariel vehicles (UAVs) known as drones to Brazil so the Brazilian Air Force could use them to protect venues and monitor crowds such as the FIFA fan fest. This complex $6M avionics autonomous drone used by the Israeli Air Force for advanced intelligence gathering is an upgrade from the Hermes 450 but will be used together with the older units for safety missions. The 900 has advanced communication and electronic systems. It will be used for security missions that calls for collecting imagery transmitted to the universal ground control station. The Hermes 900 has automatic takeoff capabilities; it can fly longer periods of time, at an altitude peak of 30,000 feet, while operating in challenging weather. The payload is large enough to carry other devices and technology. There was a 7.2km no-fly zone surrounding every stadium during match days with no fly zones over stadiums during all 64 matches. Some commercial flights were cancelled and others were rerouted. Brazil deployed Air Force fighter jets, ultra techie helicopters and Elbit UAVs for fly-overs featuring high-resolution, night-vision and thermal cams that watched from above. Brazil imported 30 remote-controlled, camera-equipped robots to the 12 host cities in order to scrutinize all suspicious objects. They paid a $7.2 million contract to iRobot Corp., for the ‘Multi-mission’ robots. Robotic security was reinforced by 50 pound US PackBot-510 military robots that looked for terrorism, bombs and other dangerous devices. The specs on these bots include cameras with remote control. These robots cruised at speeds of 14km/h, while able to rotate a full 360 degrees, and they can even climb 60 degree slopes. GPS, video displays and temperature sensors that can detect hazmet chemical, biological, bomb and radiation laced devices were available tools. These custom robots can also examine, lift and take away suspicious packages — something they did during the Confederations Cup. 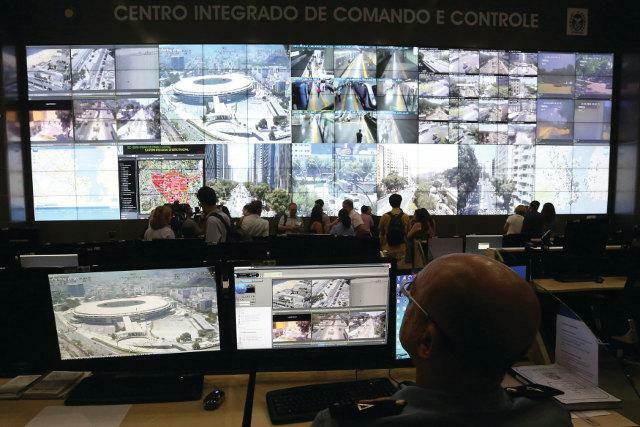 Central command centers were installed in each of the 12 World Cup cities, with top-tier centers in Rio de Janeiro and São Paulo. Security and safety had to be built into all stadiums. To meet FIFA rules, World Cup stadium operators monitored video from separate security stations. Stadium designers made certain no hidden areas were created, and emphasized all important locations be visible to cameras and monitors. Security crews had central surveillance systems in place to identify emergencies. Pyrotechnics were a security focus, millimetre wave scanners, similar to airport scanners, could rapidly check underneath clothing and inside a person’s body, both areas of high concern. Robocop, is back throwing out the first pitch during a Tigers MLB game and was a major influence on Sochi as well as the Brazilian Military Police, who may have sported VibraImage security systems wears during matches held at Arena Corinthians in Sao Paulo and Maracana Stadium in Rio De Janeiro. The device was designed to scan up to 164 feet away but can be tweaked to work up to a range of 12 miles. VibraImage system supplements x-ray machines because it identifies suspicious facial muscle movement. VibraImage uses computer analytics of live video images to measure muscle vibrations in a person’s head and neck. A tiny camera integrated into glasses captures 400 facial images per second to make educated guesses of a person’s facial muscle movement. It uses biometric data of the 46,000 points on a humans face. After instantaneously comparing data points, the system will trigger an alert if known terrorists or felons are on the stadium vicinities. Then in real-time, it transmits the data to a central computer database where information of 13 million faces is stored. 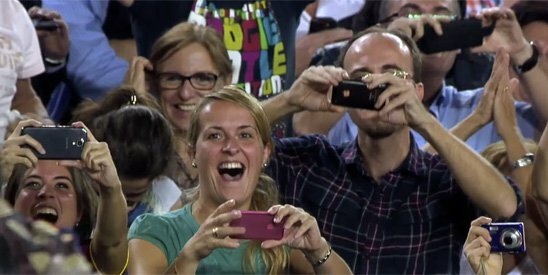 According to Sao Paulo Military Police Major, Leandro Pavani Agostini, “To the naked eye two people may appear identical but with 46,000 points compared, the data will not be beaten.” The device can monitor several different locations or events, including airports, bus terminals, fan fests, and football matches. Here is a tweet and photo via Vogo Sport and FIFA Media outlining their camera figurations for each of the 12 World Cup host stadiums. 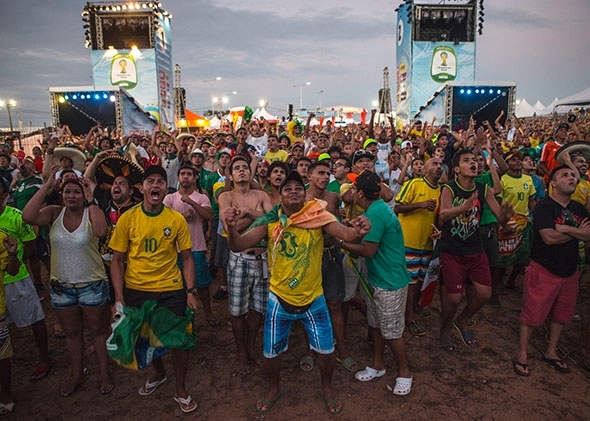 Sports Techie, The FIFA WC and FanFest at the host cities were a huge success but were on high alert due to the large 2013 Confederates Cup protests by the people of Brazil who gathered in mass to let the government know that spending public money on infrastructure was not going to pay for inadequate public services. Big screens were a rally point target. More than 1.5 million Brazilians protesting over two weeks rallied around the issues of privatization of stadiums and people being forced out of homes. Over 300,000 gathered in Rio to protest. Health care, education and transportation is lacking across the country at a time when $15 billion was spent to host both the tournament and 2014 World Cup events. The World Cup was a relatively protest free environment but the people’s organized message through social media about no public funding for stadiums was heard around the world. FIFA executives were concerned about even bigger World Cup rallies that never truly materialized. 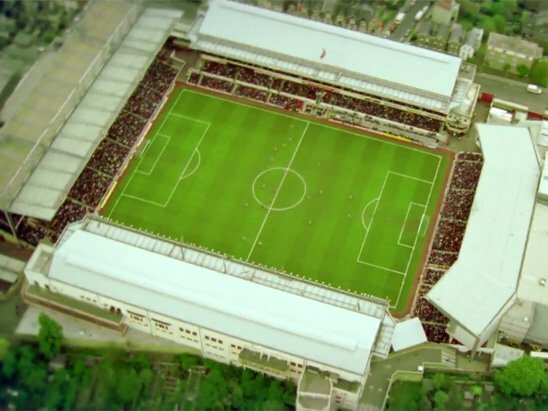 I personally feel that the public money for stadiums business model has had its due course. At a time in our world when 75 people control over half the world’s wealth, asking public funding to pay for stadiums should be over, including here in the United States. An example that hits close to home is the Detroit Red Wings and Tigers ownership plan to build a new hockey arena and revitalize the surrounding areas while spending $450 million that includes accepting public money from a bankrupt city my Polish Dad and his family grew up in. Here is hoping the infrastructure and technological advancements in communications, transportation and venues the World Cup brought to Brazil helps the people as a whole and contributes to making the Rio 2016 Olympics more cost-effective. Otherwise, White Elephant stadiums, over-the-top security expenditures and the recent corruption of the World Cup 2022 bid process by Qatar are a poor legacy for FIFA and sports tech history.